As one of the greatest water-users, hospitality projects provide one of the greatest opportunities for water conservation. While an office building’s indoor water use is pretty small, once you fold showers and laundry into the water-use equation for a hotel, many possibilities open up. Here we focus on laundry solutions that can provide big operational savings and can make the difference in getting project approval in drought-conscious California. Rule of thumb for laundry is 12 lbs of laundry per room per day, and 3 gallons of water per lb per load using conventional washing equipment. So, for a 100 room hotel, we’re talking 3,600 gallons per day, or 1.3 million gallons of water per year! Here are some great options that can be used individually or in combination. Hilton Homewood Suites in Palo Alto appreciated the water savings from this ozone system, with the added bonus of longer linen life! · Ozone – Injecting ozone gas into the wash water serves as a very effective cleaning agent with very little detergent needed and no bleach. Everything but restaurant linens can be washed in cold water, and without the chemicals, the rinse cycles are reduced, saving 30% on water overall. Check out WaterEnergy for more details. · High-efficiency washers – all kinds of equipment are designed to use less water. An intriguing one is the use of polymer beads such as Xeros. Small beads do the agitation work, reducing the water volume to about .6 gallons per load! · Laundry-to-landscape (L2L) – Depending on how much landscaping is in the project, laundry waste water can be used for irrigation. ReWater has a clever, low-cost system, and there are other products that have more sophisticated treatment and storage. We prefer ozone systems when using laundry-to-landscape to reduce chemical contamination. · Recycled Laundry Water – Recycling laundry water for re-use as laundry water has the best water savings. It does require some storage capacity and the current up-front costs warrant at least a 100-room hotel. 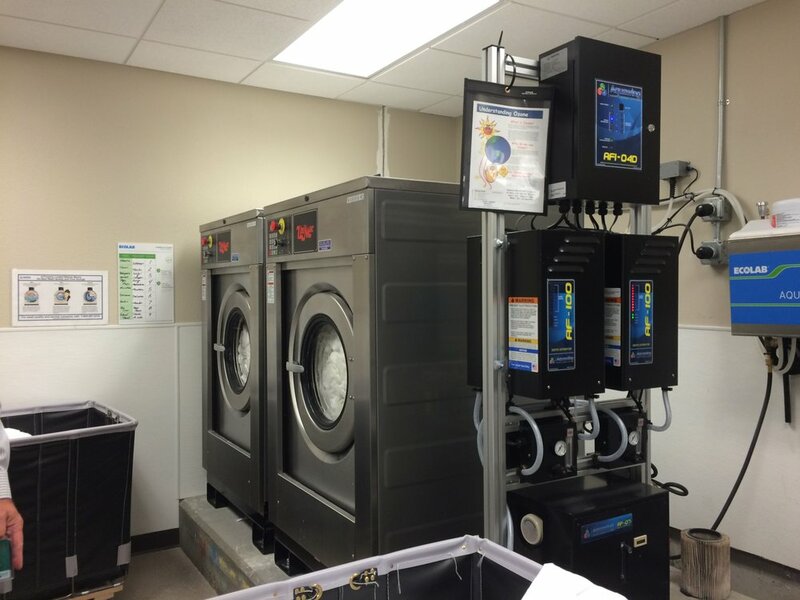 Voltea and AquaCell have systems specific to commercial laundry. Here is the comparison we developed for a 100-room hotel, assuming 80% occupancy and 12 lbs laundry per occupied room per day. When comparing systems, several factors will weigh in – cost of water, cost of sewer, area of landscaping, space constraints for equipment, and, of course, up-front cost. Still, it’s likely at least one of these options will be a good match for your hotel, or even multi-family housing project. And if you’re really looking to the future, check out this 1-minute video of a dryer that uses vibrations instead of heat to dry – all electric ZNE, here we come! Older Post860 On the Wye Goes ZNE!